Secretary of Defense Chuck Hagel consults with senior members of Congress on the recent chemical attack in Syria. 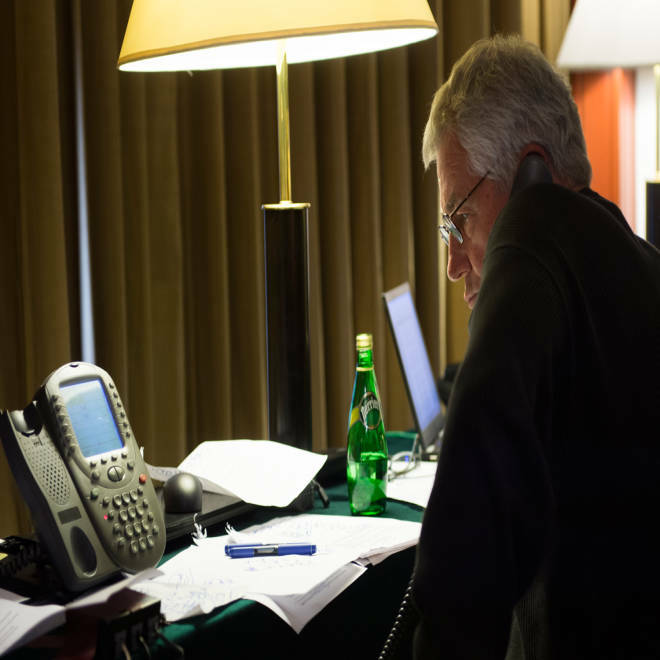 Secretary Hagel participated in the call in the early hours of the morning from Manila, Philippines, where he is wrapping up a week-long trip to visit allies and partners in Southeast Asia. Lawmakers from both parties on Thursday evening said President Barack Obama had more work to do to sell a skeptical Congress and war-weary American public on the wisdom of U.S. military intervention in Syria. Following a 90-minute briefing for lawmakers featuring top administration brass, members of Congress said the president still must build political support for military strikes against Syrian strongman Bashar Assad and his government. Representative Buck McKeon says he is 'disappointed' in President Obama regarding his response to the Syria conflict. He added, “[Americans] are very war-weary ... there are problems if we take action, there are problems if we don’t take action." The White House said in a statement characterizing the briefing: "The views of Congress are important to the president’s decision-making process, and we will continue to engage with members as the president reaches a decision on the appropriate U.S. response to the Syrian government’s violation of international norms against the use of chemical weapons." Top Democrats came away from the briefing generally supportive of American military action against Syria, though a significant number of other Democrats have joined with GOP colleagues to demand a vote in Congress before the president takes any action. "Tonight's briefing reaffirmed for me that a decisive and consequential U.S. response is justified and warranted to protect Syrians, as well as to send a global message that chemical weapons attacks in violation of international law will not stand," said Sen. Robert Menendez, D-N.J., the chairman of the Senate Foreign Relations Committee. Democratic Leader Nancy Pelosi said in a statement: "On the call, I agreed with Speaker Boehner and other Members who stated that there needs to be more consultation with all Members of Congress and additional transparency into the decision making process and timing, and that the case needs to be made to the American people. "It is clear that the American people are weary of war. However, Assad gassing his own people is an issue of our national security, regional stability and global security. We must be clear that the United States rejects the use of chemical weapons by Assad or any other regime," Pelosi's statement read. "What Assad has done is outside the realm of basic human rights." White House spokesman Josh Earnest offers some insight into the Obama administration's communication with members of Congress over Syria. But the aftermath of Thursday's meeting made clear that Obama must do more to overcome mounting skepticism from lawmakers who question the prudence of U.S. involvement in Syria's protracted civil war. Sen. Bob Corker, R-Tenn., the ranking member of the Senate Foreign Relations Committee who supports intervention, said the administration would be "far better off if they seek authorization" from Congress. And Sen. Carl Levin, D-Mich., chairman of the Senate Armed Forces Committee, urged Obama to provide lethal aid to verified rebel groups in Syria "while we seek international support for limited, targeted strikes" — an implicit concession that the support isn't there yet. Indeed, the briefing came shortly after British lawmakers voted against Prime Minister David Cameron, who sought to join with the United States in launching military strikes against Assad, who stands accused of using chemical weapons against rebels earlier this month. Cameron said his government would "act accordingly," leaving President Barack Obama to weigh whether to proceed with an attack with little support from major allies. Speakers on the call included Secretary of State John Kerry, Defense Secretary Chuck Hagel, National Security Adviser Susan Rice, DNI Director James Clapper, and Vice Chairman of the Joint Chiefs of Staff Admiral James Winnefeld, according to congressional sources familiar with the call. The briefing, which was not classified because many lawmakers — who are away from Washington during their monthlong recess — had to call into the briefing, focused on laying out evidence of Assad's guilt in the widely publicized chemical weapons attack earlier this month. Officials are said to have laid out proof that Assad's brother was involved in the attack. Obama himself called House Speaker John Boehner, R-Ohio, and Senate GOP Leader Mitch McConnell, Ky., on Thursday to personally brief them about Syria. He did the same for Senate Majority Leader Harry Reid, D-Nev., and House Minority Leader Nancy Pelosi, D-Calif., on Wednesday. But while Obama has won some level of support for retaliating against Assad for using chemical weapons, lawmakers are vocally insisting that Obama make his case before Obama and the public — perhaps allowing lawmakers to vote on the matter first. "While the administration has engaged in congressional consultation, they should continue to be forthcoming with information and would be far better off if they seek authorization based upon our national interests, which would provide the kind of public debate and legitimacy that can only come from Congress," said Sen. Bob Corker, R-Tenn., the ranking member of the Senate Foreign Relations Committee. The briefings were intended to build political support for military intervention in Syria after initial signs of resistance from Congress. A growing number of lawmakers have demanded a vote — as the U.K.'s Parliament had done on Thursday — before Obama proceeds with any action. Beyond complaints about a lack of consultation, 116 House representatives (98 Republicans, 18 Democrats) signed a letter demanding a vote in Congress before any assault is launched against Syria. Fifty-four House Democrats (some of whom signed that first letter) wrote Obama on Thursday asking him to "seek an affirmative decision of Congress prior to committing any U.S. military engagement" in Syria. Libertarians like Sen. Rand Paul, R-Ky., have also suggested that Obama lacks the power to order an attack against Syria, and moreover, Paul argued that Syria has "no national security connection to the United States." All the while, the administration emphasized that Obama had not made any decision about how or whether to proceed with an attack. But while the administration had telegraphed its desire to proceed with targeted strikes as early as Thursday, that process has been slowed by internal political debates in the countries that had seemed poised to join an international coalition. Polls suggest the public has little appetite for U.S. involvement in Syria's protracted civil war. NBC News will release new figures on the matter on Friday morning. But Congress' demand for more consultation from Obama threatens to delay the process further, thereby risking a slow bleed of public support from any attack. If lawmakers demand to first vote on intervention, it could delay matters further. Congress is set to return from its break on Sept. 9. Coloring the whole debate is a public hangover from two extended wars in Iraq and Afghanistan last decade. Iraq, where American involvement was seen as elective and based on intelligence that turned out to be false, has particularly set the context for the debate about Syria. British lawmakers repeatedly invoked Iraq during their debate on Thursday. A State Department spokeswoman rejected the comparison on Thursday. "Iraq and Syria are in no way analogous, we are not considering analogous responses in any way," spokeswoman Marie Harf said at the State Department. NBC's Catherine Chomiak and Carrie Dann contributed reporting.